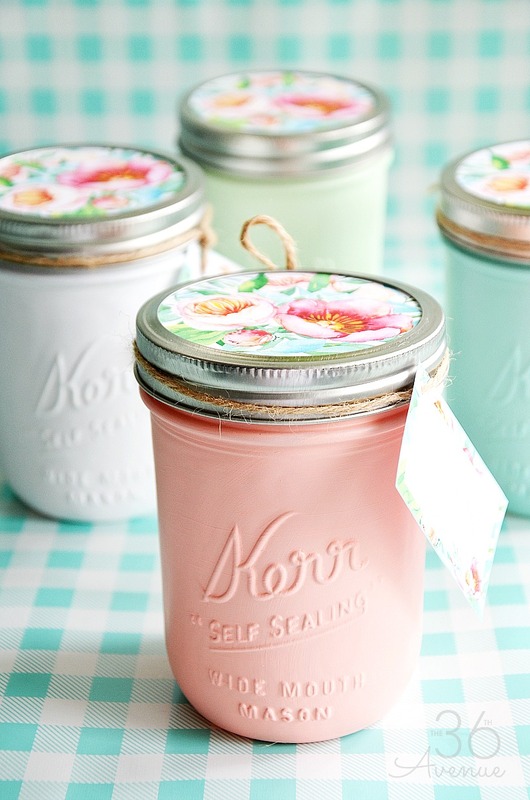 Beautiful Mason Jars and Handmade Gift Idea for any occasion. 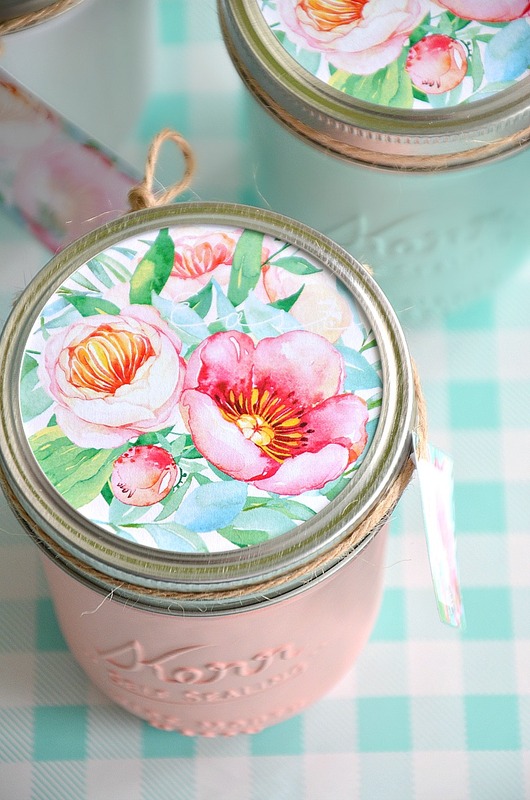 There is so much you can do with Mason Jars and making handmade gifts is one of my favorite things to do with them! Inspired by Spring and the gorgeous colors and flowers that I’m seeing outside, I made these adorable jars. Acrylic or Flat Spray Paint – I used Seaside Green HERE, Aqua HERE, Ballet Slipper HERE and White HERE. The first thing you want to do is wash the Mason Jars. When they are totally dry, spray paint the white primer. This would make painting the jars much easier and the color will turn even. After the primer is dry go ahead and paint the jars. You can use spray paint or acrylic paint. Spray paint is faster but both types of paint work great! I painted mine in four different colors so you can see how versatile these printables are. I used White HERE, Ballet Slipper HERE, Seaside Green HERE, and Aqua HERE. While the jars are drying print HERE and cut the lid toppers and tags. I used a paper puncher to make a small hole on the corner of the tag and then I threaded a piece of twine through it. Then write your special message and tie the tag around the jar! When you are ready close the jars and place the circle printable on top of the lid and then tighten the lid. I made the gift tags without wording so you can use it for any occasion. This way you can write on it whatever you want and use this gift idea for Easter, Mother’s Day, Get Well Gifts, Thank You Gifts, and even Birthday Gifts! 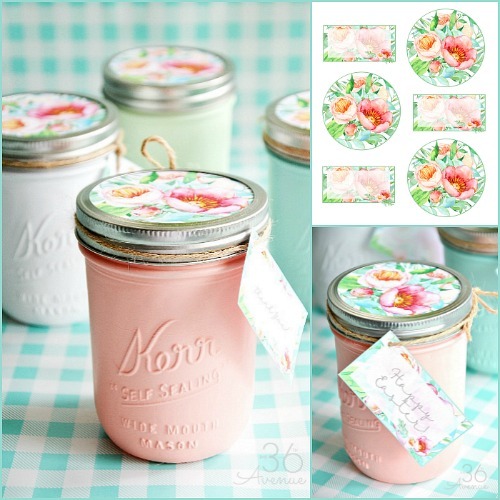 I also think these mason Jars would be adorable for party favors and for bridal and baby showers! I would personally love to receive something like this anytime of the year! 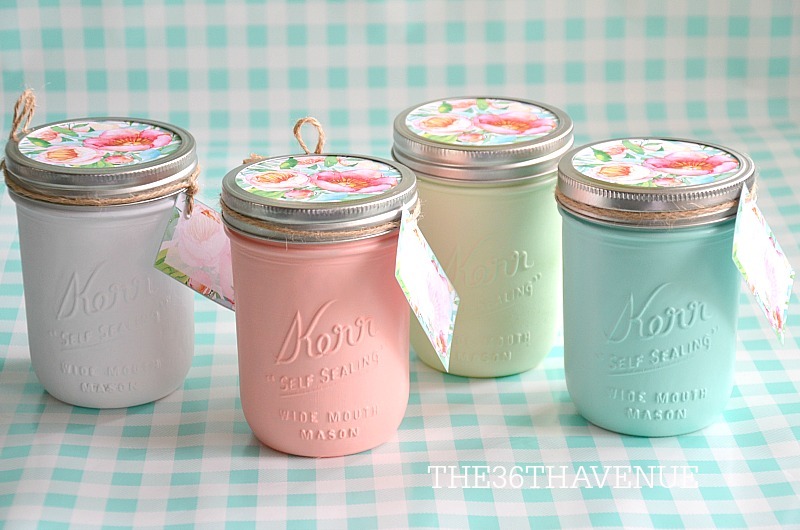 I’m planning to fill these Mason Jars with cute jewelry, lotions, makeup, lip balm, and things like that, and give it to my girls for Easter! 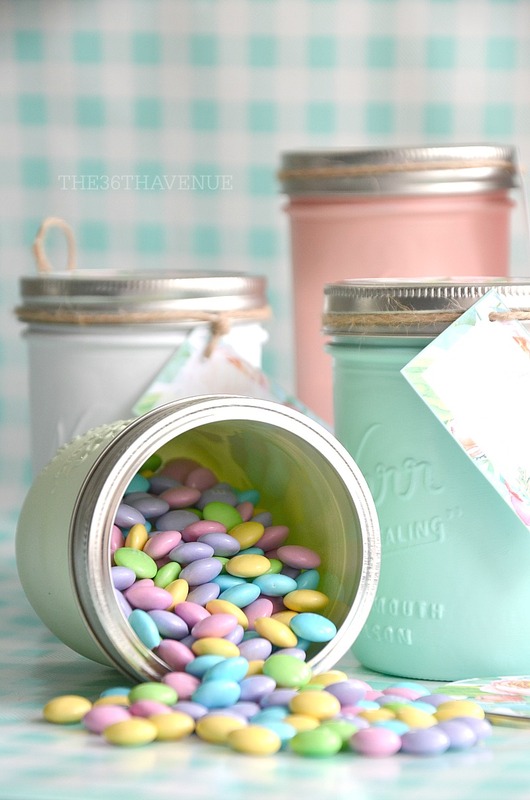 Another idea is to fill them up with candy… The possibilities are endless! I’m sure these would also make the most adorable gifts for Teacher Appreciation Week! Click HERE when you are ready to print! As I said in the beginning of the post, I love using Mason Jars for gifts and here are some other ideas that I have made over the years! We love this idea for teacher’s gifts. Fill them up with their favorite candy… Too sweet! Such a clever gift idea for teachers! You are so sweet! Thank you my friend! Thank you so much for inspiring me into making new things and trying new recipes. We’re moving abroad so I’ll make sure to keep in touch so I can take a piece of home with me. Your comment made my day! Wishing you the best in this new adventure and journey! 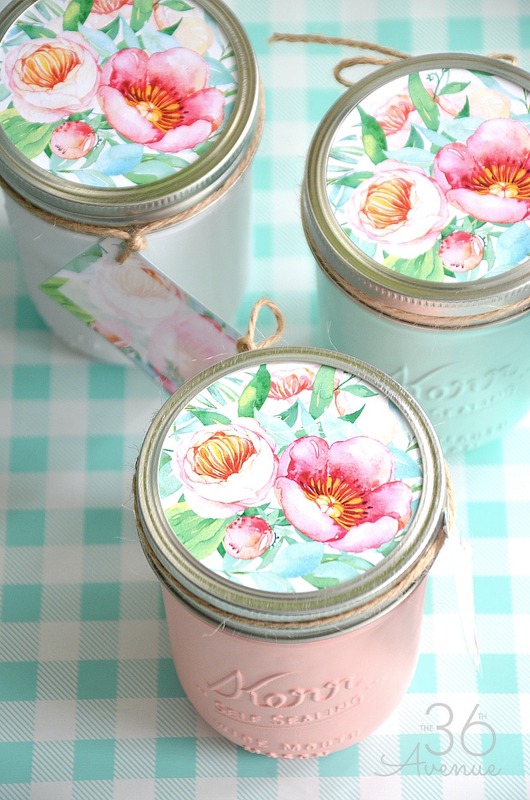 These jars are so pretty and the printable are so cute. Thanks for the inspiration. You are very welcome… Thank YOU SO MUCH! 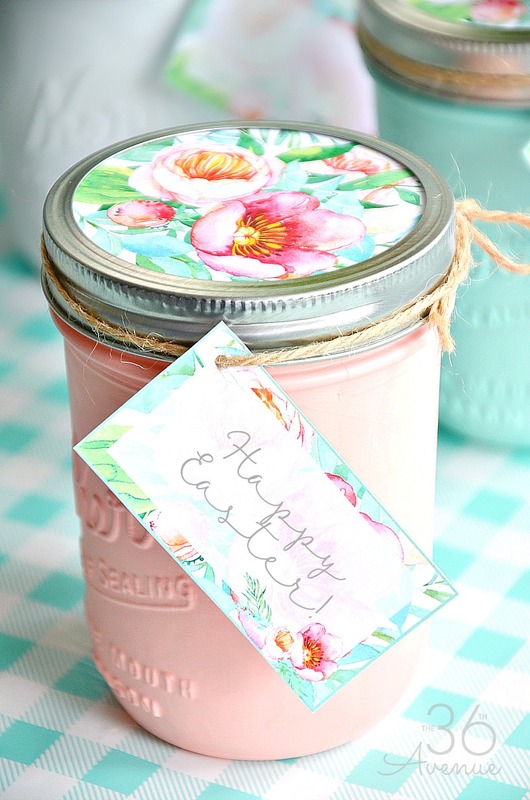 What a beautiful printable to go along with the mason jar! It really says “springtime”! Thank you so much for featuring my bedroom here! Love this Friday night party! You are welcome Gloria… Your bedroom is gorgeous!